(Photo: WCC / Peter Williams)Dean Anders Gadegaard addresses the World Council of Churches Assembly in Busan, South Korea held between October 30 and November 8. BUSAN, South Korea - The public reach of the World Council of Churches has been called into question during the WCC's 10th Assembly with one delegate saying its communications has become a "prophetic whisper." Representing an estimated 560 million Christians worldwide, some delegates of the WCC are wondering if the World Council of Churches is reaching those represented, and also those not represented. "It is not possible to do a lot together for justice and peace if we are not communicating well with one another, with the many who build public opinion, and with the people and institutions of power," Rev. Olav Fykse Tveit, general secretary of the WCC, during his first report to the General Assembly. Some journalists reflected that later in the day, Tveit appeared to contradict himself when he stated during a press conference, "Not everything we do and say is primarily meant for the secular press. That is not the most important dimension of what we do." Dean Anders Gadegaard, the moderator of the WCC's finance committee and former president of the now defunct Ecumenical News International, could not believe the general secretary had made such a comment during a press conference. Lutheran Copenhagen Dean Gadegaard told Ecumenical News, "I almost hope that he did not say that. That cannot be true. That's wrong. I know him very well. I'm amazed if he has said that. If it is not meant for the secular world, what is the idea of always quoting, 'So that the world might believe that we are one..."
Gadegaard was referring to the biblical verse from John 17:21, which refers to the prayer of Jesus the Garden of Gethsemane before his crucifixion. Praying on behalf of the world, Christ says, "that they all may be one, just as you, Father, are in me, and I in you, that they also may be in us, so that the world may believe that you have sent me." The verse is a central tenant for the World Council of Churches, a council made up of some 350-member churches from around the world. The WCC has been meeting between October 30 and November 8 in Busan, South Korea. Among its tasks it has elected new presidents and its main governing body, its central committee to represent the member churches in decisions regarding the work and voice of the WCC between its once every seven years assemblies. Rev. 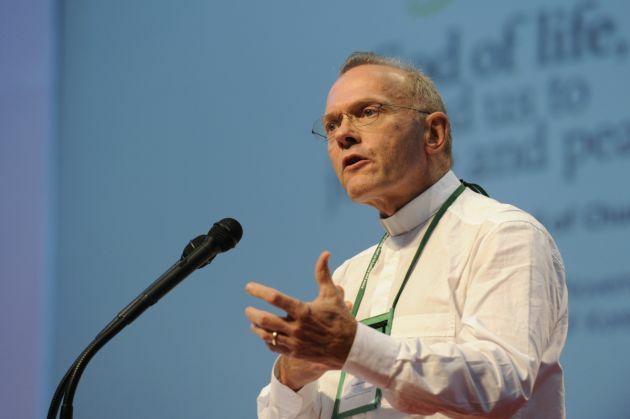 Walter Altmann, Moderator of the WCC, defended the prophetic voice of the WCC during his first report to the assembly, the highest governing body. He also told journalists that sometimes the WCC did not want to shout its message. During the question time following the reports, Gadegaard asked, "Has the prophetic voice turned into a whisper?" Dean Anders wonders how the WCC can have a prophetic voice if the public does not hear that voice through media outlets. "Its not just communication," explains Anders, "It's a media strategy about how to reach the larger world that is not aware of the WCC. "Let's begin with three or four journalists and one should be the general secretary's press secretary, making headlines out of his speeches. We don't do that. That's why it is a prophetic whisper. "Today, you need to be much more proactively engaged in considering how to approach the public agenda. There is no serious paper on that in the Assembly. There is no strategy and no one really employed to do that," Gadegaard said. When asked why laypeople within the WCC's member churches are not receiving information about the ecumenical movement, Gadegaard responded, "The only way to communicate effectively, even with local congregations, is via the secular world. "Churchgoers would know more about the WCC if we were able to make it interesting to the general public." Rev. Matthias Meyer, a delegate to the WCC from the KonfessionsKirche Institut des Evangelischen Bindes in Germany visited the Haedong Yonggungsa Buddhist Temple in Busan on Saturday. While there he discussed the current state of the WCC with Ecumenical News. Meyer said that the ecumenical movement needs a new vision for communication if it hopes to remain active in the world. "People looking at the Internet can see what's happening in other parts of the world." Bishop Antonius Markos, who heads African Affairs for the Coptic Orthodox Church in Egypt was with Meyer at the time and noted, "Through the Internet and the media everybody in every village in the world can see what's happening. All the people of the world are waking up."